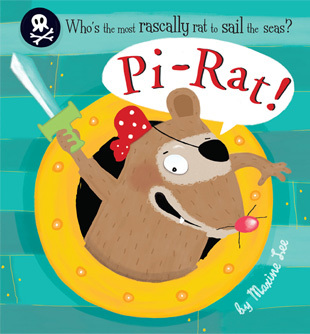 Pirate-loving youngsters will enjoy meeting Pi-Rat and his brave, swashbuckling crew. They aren’t afraid of sharks and crocodiles. But there might be one thing that frightens them a little. In this zany, funny pirate adventure, youngsters find a silly story about pirates who will eat your food and steal your booty. They aren’t afraid of anything–or so they say. But even brave pirates must be afraid of something. Kids will love this crazy story and its vibrant illustrations. The partially 3-D image on the front cover as Pi-Rat pops out of the porthole is a nice touch. I plan to pass this book off to my little nephew who will be three next month. He’ll enjoy this one.